* Can pre-define, customize and configure the DATA extraction for selected set of crucial Valves/Dampers/Actuators or other FCEs. * Simultaneous and spontaneous monitoring and assessment of FCE network. * Highlights operational Key Performance Indicators like severity of valve movements, extent of shocks due to reversals, stiction/jump, saturation and other hardware related issues. * Uniquely displays health indicator for each FCE with colour coding for visual inspection. * Can set and automatically schedule analysis and results for different user and responsibility levels. * Can track attention given and progress of pre-/post health status. * Auto generate reports and alarm SMSs.
? Want to Assess plant status – contact us for OPTIMakx-SERVICE (Two plant wide Audits/Year + 1 day Training). 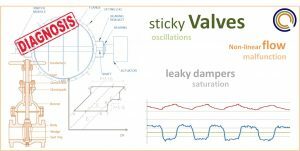 Process experts using the tool will provide Health check-up of important valves/dampers and other actuators in the plant, diagnosis for major issues and suggestions for improvement.
? Want to Update often – get the benefits of continuously improving tool/ algorithms, world-wide FCE monitoring experience and bench-marking with best in your process/industry. Access multi-user / unlimited analysis option with OPTIMakx -CLOUD on internet.
? Want to Use regularly – install & assess plant health on timely basis, configure to your needs, customize to your plant and run on your PC/intranet on demand/ as scheduled and get the snap shot of actuators/valves and manage them systematically with OPTIMakx –PRODUCT. Unique and new decision support tool. ♠ Give us chance to bring this predictive TOOL to your plant.